Everyone loves Vans. When it comes to a long-lasting sneaker brand that can stand the test of time, Vans ranks up there. The reason? It’s simply the best of the best. It’s not just our opinion, either. Just look at the neverending list of longtime lovers. From sneaker enthusiasts to Hollywood A-listers, Vans sneakers are near-and-dear to many hearts. What do Justin Bieber, North West, and Julia Roberts all have in common? All of them have been seen rocking Vans! The chic-yet-comfortable option is not just our pick, but the stars’ favorite option, too. So what better way to join this seriously stylish bandwagon than by slipping into this sneaker? After all, it has a bandwagon of over 3,000 reviewers in support of it! See it: Grab the Vans Classic Slip-On Core Classics with prices starting at $50 available at Zappos! 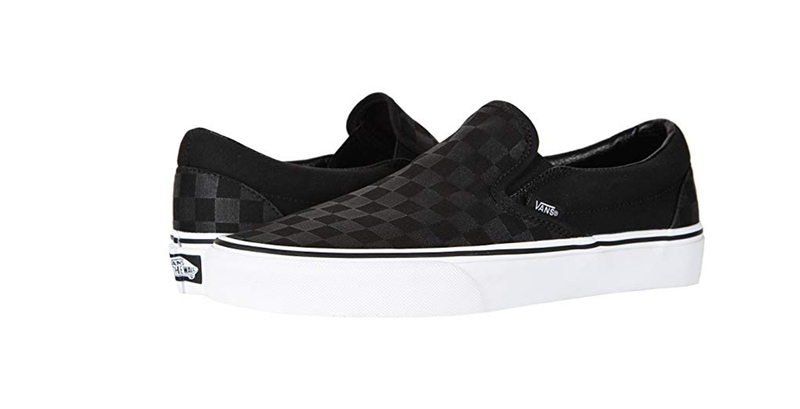 The Vans Classic Slip-On Core Classic is just that, a classic. It’s actually the classic style (and shoe!) that started this entire phenomenon. So it’s no wonder this OG has so many fans! The easy-to-wear, classic slip-on is the perfect option when looking for a shoe comfortable enough for all-day wear. Truthfully, it was designed for long-lasting wear. The durable canvas upper comes equipped with a padded collar and footbed. There’s also a cotton drill lining that provides excellent breathability, too. Think of all of those ultra-hot, super warm weather days that feel just so unbearable. Much to our liking, this super lightweight option will now make them a little more bearable! Sure, the design is great and all, but the feel is next level. The vulcanized construction doesn’t just look good, it feels good, too. It doesn’t just look lightweight and airy, but it feels it too. The gum rubber also features Vans’ signature waffle tread that provides superior grip and support. Across the board, so many reviewers raved over this ultra-sleek silhouette. It probably has something to do with the 10 sensational shades up for grabs, but we’re confident their love extends past the color options. We lost count over how many reviewers complimented how comfortable and stylish this sneaker was. It’s important to note that, as one reviewer wrote, the lack of laces for this slip-on sneaker doesn’t make them feel loose or uncomfortable throughout the day. And so many reviewers agreed! That’s right, this well-fitting shoe also happened to fit well, too. It also fits right into our closets! When looking for a staple with endless styling capabilities, this is the sneaker we can always turn to. From dresses and denim jackets to comfortable joggers and cropped hoodies, there is simply no wrong way to wear this slip-on classic. Since these are classic and comfortable, it’s a no-brainer on why so many celebrities love this shoe. Whether it’s Justin Bieber or fashion star-in-the-making North West, it’s well-proven that this sneaker is the ultra-chic option and so is the entire brand. When it comes to a highly-wearable, super versatile shoe, Vans has (and will always!) take the cake. So instead of beating them, join them by slipping into this sleek slip-on sneaker. Not your style? Check out additional Van options also available at Zappos!